APEX Bracito's Fromage is a herdsire to have confidence in. He is a large-framed, large-boned male with a square confident presentation. And loaded onto that substantial frame is a truly lovely fleece. 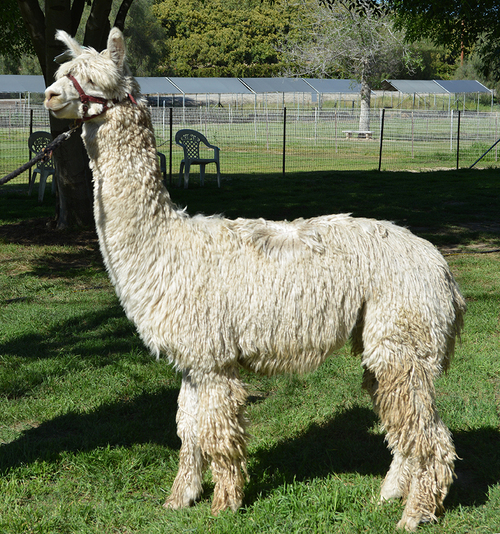 He has the high luster that is characteristic of both of his parents, really nice organization into his 4th fleece, and a high degree of retained fineness. Fromage's first crias are here and we are pleased. They are exhibiting his size and vigor, as well as beautiful fleece with high luster. His bloodlines carry back to Ramilo, Baron Lafite, Uribe and Santiago---some of the most significant original Accoyo lines. With a pedigree like this and his amazing phenotype you would be hard-pressed to find a male with more to recommend him. He is for sale, and also available for breedings. Call us today!